Those who regularly read my blog will probably know that I do love to plan and I love stationery! 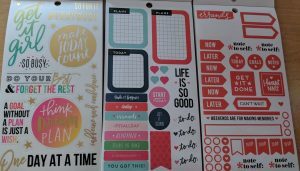 About three years ago I discovered the Happy Planner range by MAMBI which is an American company. They are now more available in the UK as to when I first found them which is good. 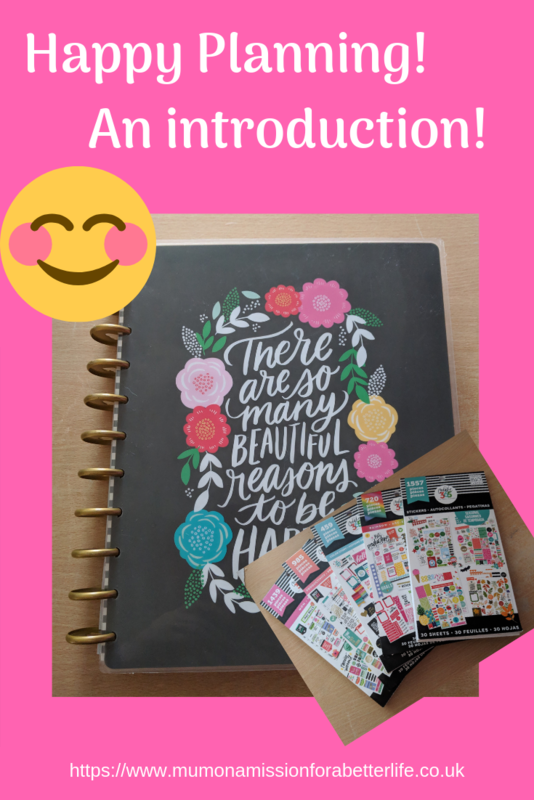 I fell in love with their planners and stickers which you use with the planners so I thought that I would share my love for the happy planner with you all. So, what exactly is a happy planner? 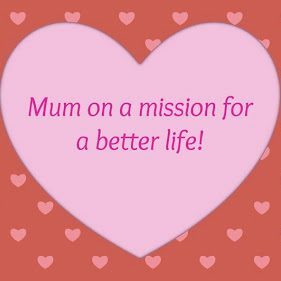 It is so much more than a planner or organiser! You decide how much time you would like to spend using decorative stickers and accessories. Some people use very little but I like to use lots of bits and bobs. 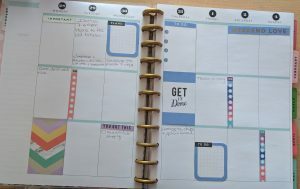 The happy planner is a disc bound planner which you can easily add or remove pages from. It is sturdy and the paper is good quality. The happy planner comes in a range of different sizes and styles, there really is one to suit everyone! This was the first happy planner which MAMBI introduced. It is similar to A5 in size and has a verticle layout. As with all of the happy planners, they come in either a 12 month or 18 months edition and can be dated or undated. The mini is great if you want to take the planner out and about with you. The mini has a horizontal layout and was the first happy planner to have a horizontal layout. Of course, as this is much smaller, there is less room to write and add stickers so I used this as a second planner to take out with me which only had important information inside so that I would know if I had plans when making appointments and so on. The big happy planner is huge! In my opinion, this is too big to take out and about with you but this is actually my favourite happy planner as I use it at home to plan my whole life! 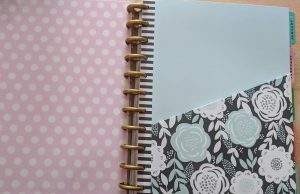 As well as the planners there is a whole host of accessories which you can buy to add to your planning bliss! 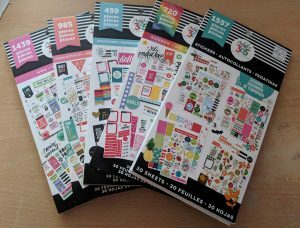 There are many ranges of stickers which you can use in all three planner sizes. 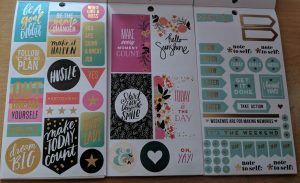 There are two main types of stickers, ones that are for decoration and ones which are often referred to as functional stickers. These may have spaces for you to write, checklists and reminders for things which you need to remember. The decorative stickers are all so pretty and they also have many stickers with positive quotes which I love. There are also washi tapes, clips, and magnetic bookmarks, covers, pockets, pencil cases and even tote bags. They also have recipe planners, faith planners, health and well-being planners and teacher or student planners as well. 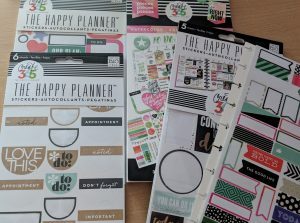 After three years of experimenting with different happy planner sizes and combinations, I have finally found that the big happy planner is the one for me. 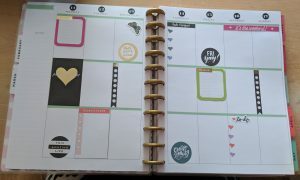 I use it at home to plan everything that I have to do and I love making it look pretty with all of the lovely stickers and tapes. I think it is kind of therapy for me as it makes me feel calm and in control of my life. 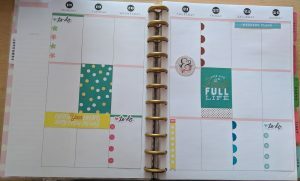 Some examples of how I lay out my big happy planner. I do this ahead so that it is ready for me to fill in and then I sometimes add some more stickers and to finish off the layout once I’ve written everything. It can get expensive, as Happy planners on average, cost between £15 – £40. 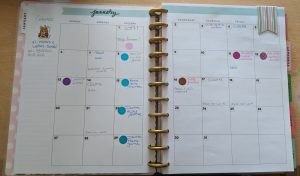 As I am on a tight budget I have to be careful to not get too carried away when shopping for accessories to use with my planner. The Americans are really lucky as they have them in many of their stores and often have coupons which mean they can buy the planners for so much less than we can. I always joke with my husband as I said that if I am ever lucky enough to travel to America I will be taking a spare suitcase with me, which I will be filling with Happy planner items to take home with me! Have you a favourite range of planners and stationery? 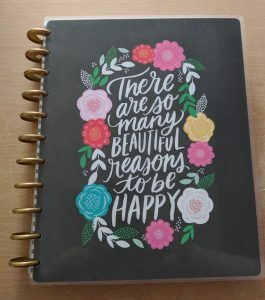 What do you think of the Happy Planner? Are you like me and enjoy planning or are you someone who prefers to take each day as it comes?